Here’s a video from FOX of the 24 Marathon challenge. Lots of 24 cast members showed up to support the fans including Carlos Bernard, Gregory Itzin, Necar Zadegan, Jon Cassar, Lou Diamond Phillips, and Michael Rodrick. 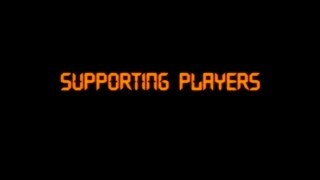 Supporting Players is a special feature found on the 24 Season 5 DVD. It includes interviews with Carlos Bernard, Debi Manwiller, Glenn Morshower, Gregory Itzin, James Morrison, Jean Smart, Jude Ciccolella, Kim Raver, Louis Lombardi, Mary Lynn Rajskub, Peggy Kennedy, Roger Cross, Sean Astin, and William Devane. Here’s video of “24” Behind the Scenes – The Editing Process DVD. The crew behind 24 explain the editing process of the series in great detail. Some of the cast members interviewed include Kiefer Sutherland, Elisha Cuthbert, Reiko Aylesworth, James Badge Dale, and Carlos Bernard. [..YouTube..] their eyes are gonna huuuuuuuuuuurrrrrrt. [..YouTube..] I’m so jealous, I’d have loved to have participated in this marathon and met Carlos Bernard rather than be stuck here in England. Good luck to all the insomniac fans though!! [..YouTube..] Oh my God i love 24 its best tv Show everrrrrrrrrrrrr !!!!!! [..YouTube..] The 100 people that got into this are the luckiest fans ever. Watching the best show on TV, meeting the cast members, and potentially winning $10,000. I’m jealous! [..YouTube..] Damn, I really should of been a part of this. [..YouTube..] Jack Bauer could watch the whole 8 seasons in 24 hours! [..YouTube..] I love how Carlos Bernard was there, high fiving the crowd. [..YouTube..] So awesome, that’s the way to watch the best show ever created. [..YouTube..] Some Korean guy died after gaming for 72 hours straight. Do these people realize 80 hours of watching TV might kill them? [..YouTube..] Just got back from checking this out..the scene is super lame now…just the tent and no other fanfare. I got there at the very beginning of Season 2 and it was already down to 53 people. [..YouTube..] so wish I could have been there. such a great experience for fans. will miss the show immensely! [..YouTube..] Will the 24 Complete Series come out on Blu-ray too? [..YouTube..] *thx* for sharing ! [..YouTube..] omg i wish i would have gone! i didnt even know about it until today! [..YouTube..] lol for the guy at the end. [..YouTube..] Any 24 fan should be able to make it through the marathon no problem. lol. The only way people should watch a season of 24 is to take a day out of your life and watch all 24 episodes in real time. carlos bernard the love of my life…. i know i must sound crazy but i’m not! [..YouTube..] I lived in Califorina I would have been apart of this. I may not have made it through, but I would have goten the DVDs and meet some of the cast members.